I had used up all of the punches on my pass to the climbing gym. I had overcome my initial paralyzing fear of falling from higher than six feet up on the wall. I felt the rush of accomplishment as I left the gym having climbed better than the time before and the time before that. I knew it was time to invest in my own pair of shoes instead of using the rental, but I was posed with the question of how to find the best rock climbing shoes for women. If you’ve never tried rock climbing before or are still on your first few adventures on the wall, I recommend renting shoes or borrowing from a female friend with good hygiene. Climbing shoes are a financial investment and it can take time to get to know your climbing style and how you want your shoe to perform. The right shoe can be an incredible asset to your sends. The wrong shoe can leave you sore or even injured – exactly the opposite of how you want to start your climbing career. The fit of a climbing shoe is the number one thing to look out for. A shoe that is uncomfortable, too big or too small can interfere with progress. I’ve ended up in pairs of shoes that were too tight for me and cut my climbing session short because I was so uncomfortable. Not ideal. The shoe that works best for my fellow female climbing partner don’t work best for me. All of our feet are unique, so finding the best women’s rock climbing shoe is a personal quest. Below we’ve reviewed some of the best climbing shoes available for women in an effort to help you take some of the guesswork out of your purchase. Black Diamond is a well-known name in the climbing world manufacturing gear since 1957. But their entrance into climbing shoe is recent. The Black Diamond Momentum is the beginner shoe of their inaugural climbing shoe line. And as one of the cheapest shoes on the market, it surprisingly does not sacrifice quality. The upper is made of a breathable knit material so the toe box isn’t going to end up turning into a puddle by the time you’re done with your climbing session. This shoe is a fantastic option for beginners looking for all day comfort on the rock and usually climb slabs, less steep walls with no major overhangs that would require using your toe or heel instead of the bottom of your foot to hang on. This Black Diamond climbing shoe for women is so comfortable that I could easily see myself walking out of the gym with them still on without noticing. It feels snug but not constrictive, thanks to the upper knit material. It’s like a hug from a best friend – it always feels comforting. The bonus of the breathable knit upper is it’s going to make this shoe a lot less sweaty. In turn, that means it’s not gonna stink. The shoe also features a hemp liner in the toe to prevent chafing or any chance of blisters during the break-in phase. As an American company, Black Diamond decided to use American sizing for their shoes which is not the norm in the climbing shoe industry. The designer says we should buy this shoe in our normal US shoe size, especially for beginners. Advanced climbers will want to start with their standard shoe size and but will probably want to go down a half size to get the snugness that assists in more technical moves. As long as you’re being honest about your shoe size and have had them measured recently, your shoe size should be the best fit available for beginners. My favorite is the “merlot” color which is fun while not being too girly or bright. My current bright blue pair of La Sportiva Tarantulance look like I walked through a tar field in them because I’ve been climbing in a gym that has some especially dirty holds. The Black Diamond Momentum in merlot is not going to look like that even on the 200th climb on dirty holds. This is an excellent beginner shoe or for any climber looking for all-day comfort. I personally love the Black Diamond Momentum because it can accommodate my desire to climb all the time. I often find myself on the wall six days a week. I also love roof climbing where I’m almost fully upside down. A lot of toe hooks come into play here so my toes take a beating. When that happens I swap over to these for a heavenly and comfortable fit that doesn’t smush my already sore toes. The Momentum is a dream to physically put the shoe on. Sometimes the first crux, the tricky part of a route, is putting the shoes on. I’ve owned shoes in the past that felt like I should have stepped into a vat of Crisco first in order to slide them on. Especially in warm weather when our feet are a little swollen even before we start a climb, these shoes will be a breeze to get on. This shoe has a stiffer sole which means standing on even small holds will feel a lot more secure than with a flexible sole. All the big-boy climbing review guides agree that this is a great beginner shoe for the price or for anyone looking to climb all day and still be able to walk into bed at night, instead of crawling because of sore toes. The Black Diamond Momentum shoe for women is a fantastic choice because of its technical advancements in construction and materials. It’s a great shoe to help beginners progress their skills while maintaining comfort. When the two-time women’s bouldering world champion partners with a legendary climbing company to create a shoe, you can’t go wrong. The Five Ten Anasazi Pro is the collaborative work of Shauna Coxsey and Five Ten Climbing. The result is a wonderfully universal women’s climbing shoe. Five Ten has been a strong leader in the climbing-shoe game, consistently coming up with new rubber that is stickier than the previous technology. The addition of the rubber toe patch make it a great shoe for toe hooks and the dual velcro closure means it’s easy to adjust to get the best fit possible. Combining these features with the mesh tongue leads to the Five Ten Anasazi Pro being a solid choice for the female climber. This shoe is the genius of the class – the one who aces every science and math test but can also write the best essay and deliver an impeccable speech. This shoe can do it all. But instead of hating it for being so damn good, we get to utilize it for every climb. It’s designed to hug the heel so well that any heel hook is going to stick. Often I find the problem of heel hooking to be that it’s not the center of my heel hooking. It can be the outside of the inside that I want to stick to the rock. The design of this shoe is perfect for achieving that. The toe is also fully rubber, a design Shauna Coxsey requested. She had previously been climbing in the Five Ten Anasazi LV but asked for it to be altered. The fully rubber toe does the same as the heel. It means that any toe hook is going to stick. Regardless of if it’s the big toe or the pinky toe that is making contact for the hook, your foot is not going anywhere until you tell it to do so. The shoe has a specialized tongue that is lightly padded but not so much that you feel like you’re wearing a chunky tennis shoe to that Jazzercise class your mom took you to. It’s a nice light cushion. And the tongue does’t overlap itself much meaning there’s more room for breathability. The Anasazi Pro is a great shoe for a diverse climber – one who climbs in the gym and outside for bouldering or sport climbing. It’s comfortable while still performing in a moderately aggressive way. It’s not going to be as comfortable as the great beginner shoes out there, but if you’re new to climbing and are sending your routes and progressing quickly, I’d say this is a great shoe for you to invest in. The Anasazi Pro is going to support your advancements and still be aggressive enough for you in the future when the routes you’re working on get more technical. The Stealth C4 rubber on the sole is sticky, a Five Ten specialty. It kind of feels like you stepped in some gum and the stuck your foot on the wall – it’s that grippy. The friction this rubber is fantastic on any type of hold – heel hook, toe hook or slab climbing. If Shauna Coxsey can win two world cup bouldering titles in these shoes, we know for sure they’re going to perform incredibly well for any of us fellow female climbers. The Five Ten Anasazi Pro is a great choice for all-around climbing performance. If you’re a climber who likes the diversity of indoor and outdoor climbing as well as different styles like slab, bouldering, overhangs and sport climbing this is a perfect choice. Redesigned in 2018, the La Sportiva Solution is an aggressive women’s climbing shoe. It’s an incredibly well-thought out shoe to maximize performance. Using a 3D shape for the heel, La Sportiva has essentially created a pocket for the heel. The women’s version of this shoe has a thinner sole in the toe than the men’s version to accommodate our lower body weight. The slightly thinner rubber in the toe area helps to feel the wall through the shoe for ideal toe placement. The La Sportiva Solution is all about the design and functionality of the structure. Aggressive shoes have a distinct downturn in the toe. This puts your toes in the strongest position possible. The pointy toe can then fit into the smallest crack or find friction on a tiny hold. With this toe design of the Solution, your toes should almost be pointing downward and slightly bent but not so bent that they become painful. Numb toes can’t feel the wall so make sure the shoes aren’t so tight that your toes are losing blood circulation. The problem with aggressive climbing shoes is they often flatten out after a while. The rubber loosens up and the shoe turns into a more moderate-level shoe without the downturned toe. But for the Solution, La Sportiva fixed that issue. The shoe’s rand, the rubber that starts at the back of the heel, wraps down underneath the arch of the foot and back around to the heel, has been redesigned for this shoe. La Sportiva says us ladies should downsize for the highest performance. The Solution is designed to excel in vertical and overhang climbing on hard boulders and sport routes. The shoe is not going to be comfortable enough for long multi-pitch climbs. The deep heel is for awesome heel hooks, which is also a testament to them fitting as snug as possible. Any extra air in the heel could potentially mean the shoe will start to come away from the heel with lots of pressure from hooking, so make sure they fit your heel well before committing to the Solution. The shoe has sensitivity in toe while being aggressive.The women’s version of the La Sportiva Solution has a softer arch area than the men’s version since we’re holding up less weight on the wall. Power from the rand feels awesome. The super sticky rubber, Vibram XS Edge, is the icing on the cake of this shoe. It can edge in on steep holds without crumpling up and losing its power. The 3D heel is one piece and rounded so any part of your heel is going to stick to the wall. If we didn’t love enough technical specs of this shoe, La Sportiva added a lock harness system to secure the shoe. It’s a simple cinch down system that pulls from two areas for the best fit – also super easy because it’s just one point of contact for the velcro. This makes them easy and quick to get on and off which is sometimes necessary with an aggressive shoe. If I’m working on an especially difficult problem, I’ll take a longer break which always begins with tearing my shoes off and giving my feet some time to breathe and relax. If you watch recent reruns of International Federation of Sport Climbing you’ll spot many climbers in this lovely shoe. Nothing speaks more about a shoe than watching professionals dominate the walls while wearing them. The La Sportiva Solution is the perfect women’s climbing shoe if you’re looking to impress everyone in the gym. Aggressive is the name of the game here and La Sportiva has given us every tool to rock the advanced routes, except bulging biceps. We’re responsible for those. La Sportiva’s Tarantulace looks nothing like its namesake of a tarantula wearing lace. Or a tarantula that has shoe laces draped over its neck like a scarf. But we can laugh at these prospects lightheartedly as we climb in the Tarantulace because the shoe is so comfortable. Best described as an intermediate beginner shoe, the Tarantulace is slightly more aggressive than a standard beginner’s shoe. It’s great for the gym or longer climbs outdoors where comfort is essential. 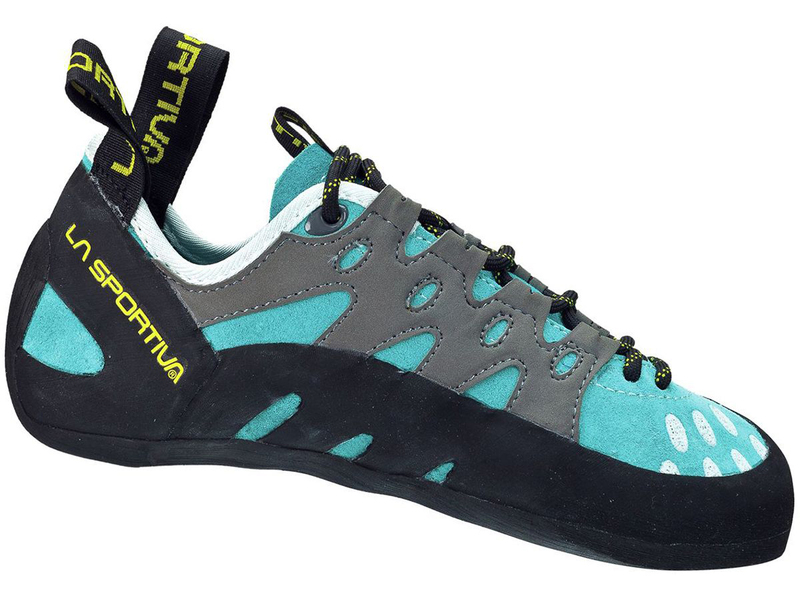 This La Sportiva is appropriate for beginner to moderately experienced climbers. Two style of the Tarantulace are currently on the market – a lace-up version or a velcro style. Which one you like best is up to personal preference. I personally like the velcro better because of the ability to adjust tightness better. Others, however, prefer the laces because replacing a blown out shoe lace is a lot easier than replacing a velcro strap if anything were to get damaged on it. The shoe has great overall performance for bouldering, sport of multi-pitch. This La Sportiva has leather for the upper which will stretch to fit your foot as your wear it more. This means you’re going to want to buy it in a size that fits snugly. Buying it too big will mean the leather will stretch out too far, and the shoe won’t hug your foot as nicely as it should. If you’re a beginner climber interested in this La Sportiva women’s shoe, I’d recommend trying on a half size smaller than your normal street shoe size and see how that feels. It should be starting to curl your toes up a bit, but nothing at all painful. Your toes should be pushed together, kind of making an extension of the ball of your foot. And keep in mind the stretch factor. I love how the toe-box on this shoe fits me snugly but doesn’t push painfully on any part of my foot. I also love that the footbed arches perfectly with the shape of my arch. The rubber on this shoe is FriXion RS Rubber. It’s a sticky rubber that will really help elevate your climbing. For the price of this shoe, the rubber is great quality. The tongue is lined so the upper part is leather but the inner is a slightly padded liner which helps with sweat management. No one likes to be standing in puddles as they climb, and La Sportiva has designed a shoe that won’t allow that to happen. This shoe is a great deal for the price. You know you’re getting high-quality performance with La Sportiva and this shoe certainly performs. It’s a great choice for beginners to intermediate climbers or advanced climbers who are working on multi-pitch longer climbs or doing a long day at the gym. Evolv really knocked it out of the park with this shoe. It’s incredibly affordable and a great all-around shoe suitable for beginners to advanced climbers. If the fit is right, this means this shoe could take you from beginner all the way into much more technical problems with overhangs, heel and toe hooks and crack climbing like you might find in St. George, Utah. It’s a neutral shoe, so it can be worn all day. The Evolv Skyhawk has a leather upper which is what most people want to see in a climbing shoe. This does mean you’re going to want it to fit snuggly when you first buy it because it will stretch with use and sweat. The tongue is super cool on this shoe because it features an Agion antimicrobial fabric so not only will it wick away moisture, it won’t let anything gross grow on it. If you’re in a long climbing session it’s nice to take off your shoes during a break. But if they stink you don’t want your climbing partners running away to rest somewhere away from your shoes. The Evolv Skyhawk won’t have that problem which is kind of them to give this service to the climbing community. The Skyhawk also has what Evolv is calling the “VTR,” variable thickness rand. Boiled down this mean the rubber rand on the shoe is thinner is spots where your foot might be squished a little, and thicker for ultimate support and stability where your foot has a comfortable amount of space. The thickest part is over the toe which can often wear out way before the rest of the rubber because of toe hooks and edging on super tiny holds. This means the rubber on you shoe is going to last a lot longer before you need to think about getting them resoled or investing in another pair. One of the coolest aspects about this Evolv shoe is you can order two different sizes if one of your feet is crying out for a bigger size. Climbing shoe companies often ignore this issue. But Evolv is willing to accommodate those of us who sometimes need a bigger size for one foot. It’s $30 extra but that is a lot less than buying two pairs of shoes to get two different sizes like I have in the past. The best review I found online for Evolv Skyhawk said they fit like a “cozy burrito.” I think that says enough convince any of us to try out these shoes. If you’re looking for an Evolv women’s climbing shoe, the Skyhawk is a great choice. It’s a versatile shoe that can be worn for beginners, intermediate or advanced climbers. It’s going to be comfortable and you’ll feel confident trusting your feet to not slip in these shoes. La Sportiva has been making the Miura for 10 years. Talk about a testament to the shoe’s quality. The Miura is an aggressive high-performance women’s climbing shoe. The sole is made with Vibram XS Grip2 rubber for incredible grip on everything including overhangs. The toe shape is great for any type of climbing from technical edging to slabs, it will perform well on all of it. The lacing system is designed to be effortless and it has a low volume height in the arch to suit us women. The La Sportiva Miura is a fantastic all-around choice for an intermediate to advanced climber. The technical specs of the shoe lead to a high-performance while maintaining a nice level of comfort so this could be worn for a short session at the gym or a multi-pitch session outside at Joshua Tree. Bonus of this shoe is if they’ve been making them for 10 years, I can’t see why they wouldn’t keep them in the product line for another 10. And finding a favorite shoe that will stick around for a while is great. Finding the perfect shoe just as the company stops making it is just about as sad as the gym being closed on holidays when I was planning on using it as an excuse to skip the fifth family event for the day. I usually don’t care so much about the look or color of my shoe, but the seafoam green on this shoe is great, especially the rubber. I get an extra boost of excitement when I climb with this shoe on. La Sportiva outfitted this shoe with a “power rand” so it doesn’t stretch or lose its shape when you put pressure on the toe for standing on small holds.The speed lacing system means that with one pull the whole shoe gets tightened. I’ve climbed in shoes that were tough to cinch on the laces which meant I was always one send behind my climbing partners since I didn’t get onto the mats when they did. The ultimate review of these shoes comes from climbers who first stepped into the Miura 10 years ago and refuse to climb in anything else. 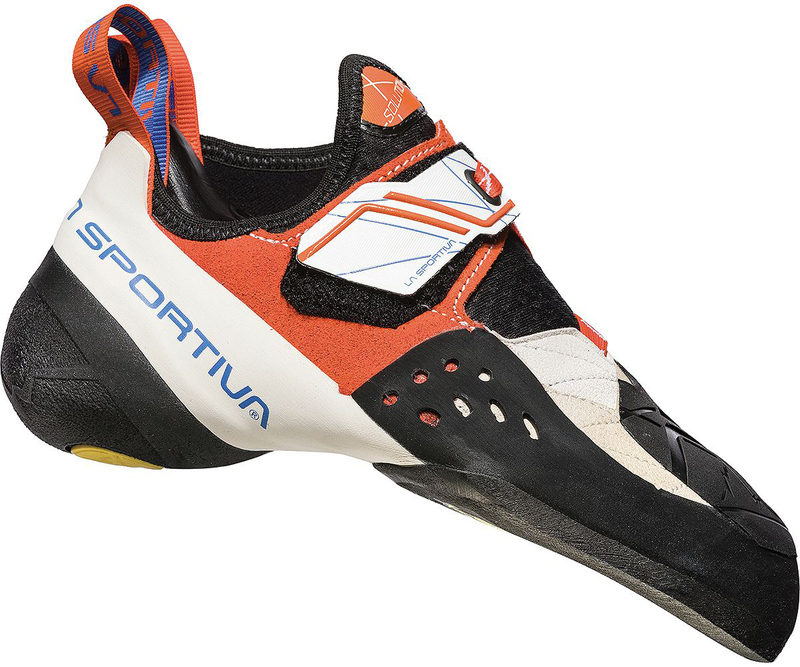 Of course the models have changed slightly and La Sportiva has introduced new technology as we advanced in the world of climbing shoes, but these shoes have a serious cult following with no end in sight. The La Sportiva Miura, while on the pricier side, is a great shoe to invest in because it will grow with your progression. It’s a fully-functional shoe for bouldering overhangs or sport climbing. It’s aggressive while being comfortable – an uncommon but incredibly useful combination that makes it well worth the price. The Scarpa Helix is a beginner to intermediate shoe with a foot shape that is not quite aggressive, but not a beginner either. It happily sits in the middle with excellent specs and performance. A padded tongue means it’s comfortable for longer days on the wall and the heel even offers a bit of cushion too – much welcomed when doing a longer session at the gym or a multi-pitch outside. The Scarpa Helix women’s rock climbing shoe is an all around all-star for beginner or intermediate climbers. For the moderate price, this is a great investment for any climber looking for versatility in a comfortable shoe without sacrificing performance ability. The grippy Vibram XS Rubber is a great sole we see in a lot of shoes on the market today, and with good reason. It’s a sticky rubber that will give your the comfort and foot stability to focus on the next move rather than freak out about a potential foot slip. The lacing on this shoe goes deep into the toe box. This allows a lot of flexibility in how the Scarpa Helix fits each part of your foot. Personally, I like a slightly bigger toe box so my toes don’t end up bruised and battered. I have a tendency to get blistered toes, but with this lacing style I can leave the toe area a little looser and tighten the arch area as much as I want. The lace system being designed like this also means this shoe can fit any foot width. Narrow feet can lace it up tighter while feet on the wider size can leave it looser. This totally eliminates the guessing game at the store of, “Is this shoe too tight for me to be comfortable in?” Just loosen up the laces if it is. Many times I adjust the laces as the day goes on and my feet get a little swollen and tired and I want more room. The Scarpa Helix is also great for accommodating longer toes. The all-day comfort of this shoe doesn’t in any way sacrifice the performance. It’s a great shoe for edging. It can handle heel hooks on difficult bouldering problems and it’s a sticky beast on slabs. This is a great option for beginner to intermediate climbers looking a shoe that will allow versatility on both rock with outside climbing and plastic holds for indoor climbing. It’s comfortable but has great performance abilities. A tried and true winner with sticky rubber, this shoe will not let you down. Does my heel feel secure enough to not slip out if I’m doing a heel hook? Are my toes comfortable with not much extra room in the shoe but not crunching up? Is the shoe’s function matching my intentions for climbing? Is the shoe within my budget? Finding the best rock climbing shoes for women is a highly individualized process. All of the shoes mentioned here are high-quality and great options, but deciding which one is the best choice depends on your foot shape, what type of climbing you’ll be doing and how advanced you are. La Sportiva, Black Diamond, Evolv, Scarpa and Five Ten all make awesome shoes. But regardless of brand, the most important part is finding a shoe that feels great and fits your individual foot properly. If possible, I recommend trying the shoe on before your commit. The best time to do this is afternoon or evening after you’ve been on your feet for a while during the day. If you order shoes online make sure you can return them if they don’t fit right or don’t feel as good as you had hoped. The right shoe that suits your budget, climbing style and level is going to feel like heaven. Climb on, ladies!